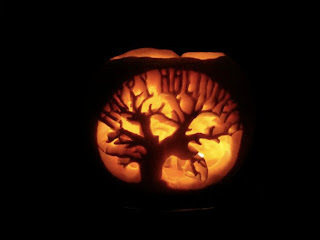 All Hallows’ Eve greetings to you all. I hope you are suitably hungover after a night in Syndicate rubbing up against various witches, zombies and token cross-dressers who may or may not be your mates. Now, in these times when the hard-strapped student is feeling the pinch even more (with the prospect of leaving university with a shiny degree, a shed-load of debt and... no job offers) we must be extremely prudent about what we throw away – wastage is not an option! So, provided it was not used as a sick bucket by a worse-for-wear flatmate last night, here are a couple of recipes to make the most of your pumpkin even after the candle has gone out. From pumpkin curry to pumpkin waffles... what a multitalented fruit. Pointy-black-witch-hats off to Sophie Harries, the skilful carver of the pumpkin shown above.